I just wanted to share with you this darling snap that Eliot (@CoachBlkrWomen) took outside Locanda Verde in TriBeCa on Sunday. Eliot spearheaded a get together with myself, Helena of Brooklyn Blonde, Lauren of Everyday to Runway, Christine of Court & Hudson, and oh, there in the middle you may recognize my blogging bff Meghan! We spent a good two hours getting to know each other, plotting for NYFW and getting absolutely stuffed on pancakes, frittata, poached eggs and iced coffees. 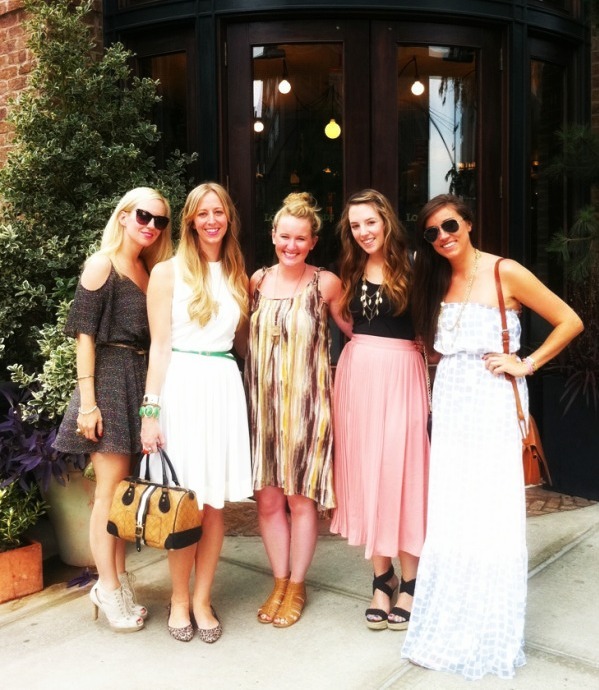 It was so wonderful to get to know these charming women with impeccable style and seriously follow-worthy blogs. If you don't know them already, I highly suggest you browse their archives for some major outfit inspiration. So pretty, ladies! You all look fabulous.